Welcome! 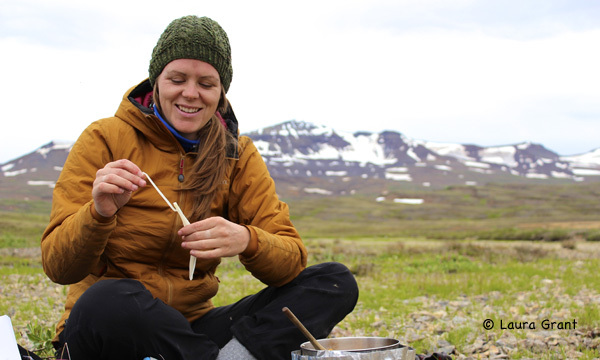 This is Kara Pitman’s first post for Raven Ecological Blog. She’s my first guest blogger too! 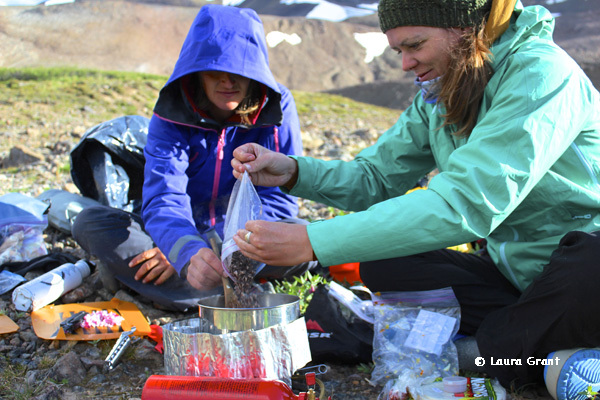 Last July, when I was tethered to my couch with an unruly broken ankle, Kara and her friends, Laura and Jen, let me in on an idea they had for a wilderness adventure in the Mount Edziza and Spectrum Range area. For many years, I hoped that my work would take me into that part of the country. So I was disappointed that I couldn’t join them. When they started talking about food, I saw my opportunity to participate, in the next best way. Running my idea by them, I was thrilled to be able to join these adventurous women, in spirit, via camping recipes that I wrote to help them prepare for their trip. This was a bit of a shift in mind-set for me because I’ve been doing much more whitewater rafting and sea kayaking, in recent years, than backpacking, which for many years I did extensively for recreation but even more so for work. 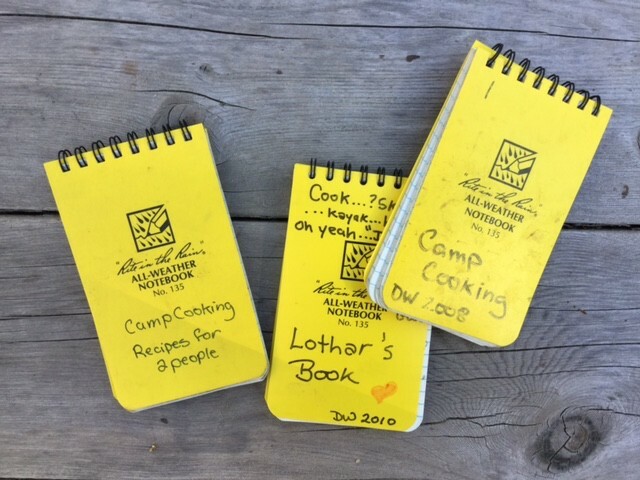 Over the years, I have hand-written several recipe books, and given them away as presents for friends and family. I can assure you that no two books are the same! Write-in-the-Rain notebooks with their waterproof paper stand up well to the rigors of wilderness travel. I adjust the recipes to the cook-to-be’s personality, tastes, and interests. For Lothar, I keep them simple, as in minimal ingredients and steps, yet he still eats well on solo trips. My most painful bear story: I was running past this grizzly bear and her cub when I got hung up in material used to stabilize the slope. I was on the trail in the background. 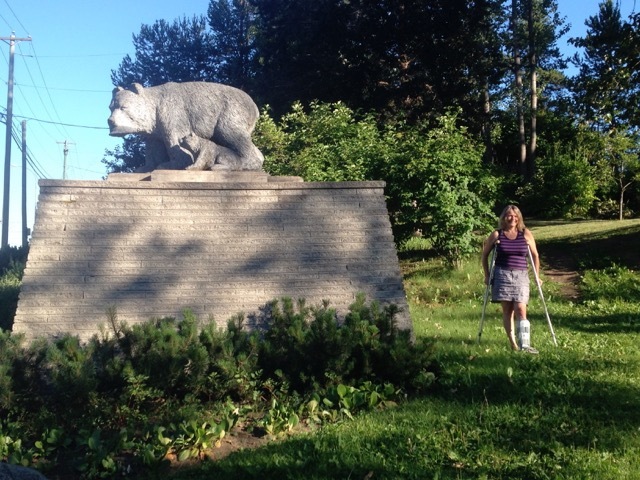 My running partner was on the left side of the statue. She heard my ankle break! This post, and the recipes that go with it, are meant to be enjoyed with friends. 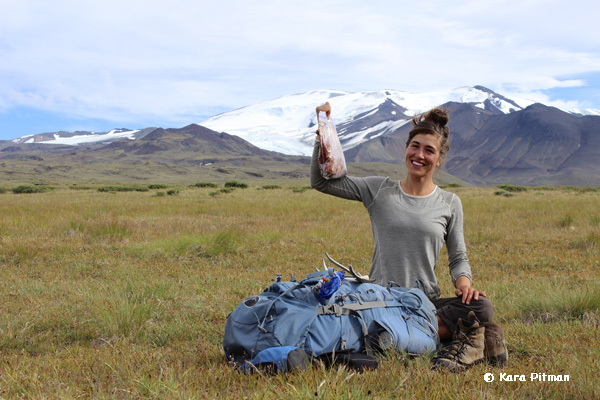 Here’s Kara’s story about the culinary portion of their nine-day, 100+ km trek in the wilds of northwestern British Columbia. 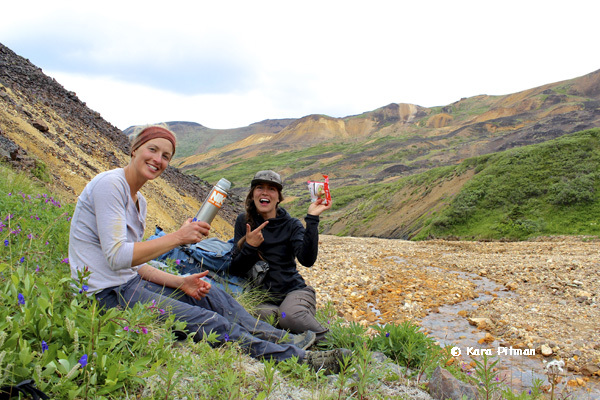 In August 2014, Laura Grant, Jen Atkins, and I ventured out into true wilderness in an area known as the Mount Edziza and Spectrum Range. Besides the adventure, natural beauty, and company what more could make the trip exceptional? Well, the food. Adventures and explorers talk endlessly about meal ideas, ways to pack down food and keep it light weight, and still taste good. 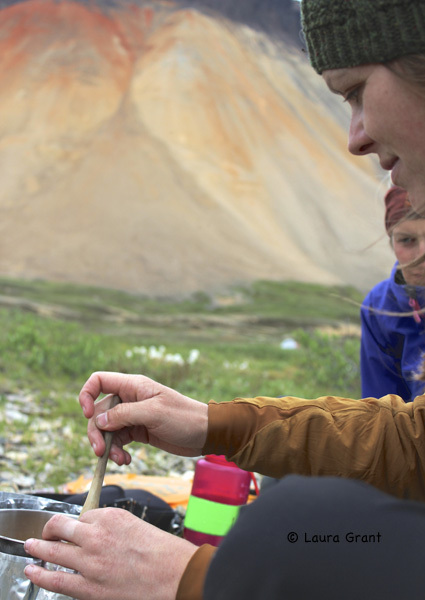 When planning for our trip, who else would we approach than Debbie Wellwood, a phenomenal cook, who is known for swinging a mean backcountry meal. Lucky for us, she was generous to gift us a (in her words) ‘rough’ meal plan. Well, after first review we were excited and feared to comprehend the effort put into this meal plan, the prep work involved, and that eating well involved packing along garnishes, spices, and sauces = weight! I will say it now – every second spent prepping was worth every bite – we ate like queens! 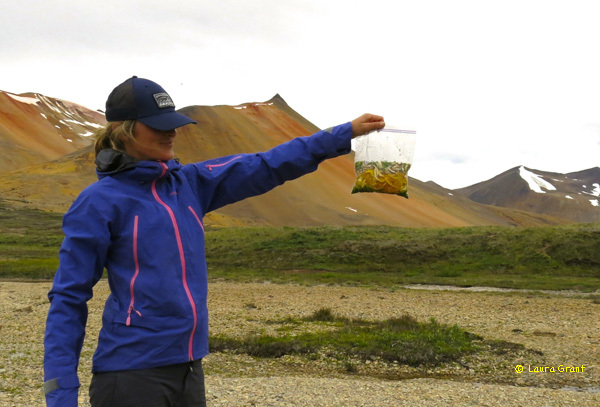 After being dropped off at Little Ball Lake around 3:00 pm to start our nine-day adventure, Laura turned to Jen and myself and said “What are we going to have for dinner tonight?” This kind of question became the norm, or some would say obsession. Pasta with Thai Peanut Sauce was our inaugural meal. Minds and bodies filled with pure joy, fear of unknown, and general overwhelm, we lavished up those noodles. The beauty to this meal and many more – dehydrated coconut milk! Jen displays the process of rehydrating the veggies for each meal. We had great intentions to start our rehydration process during an afternoon break in prep for dinner, alas that rarely happened. 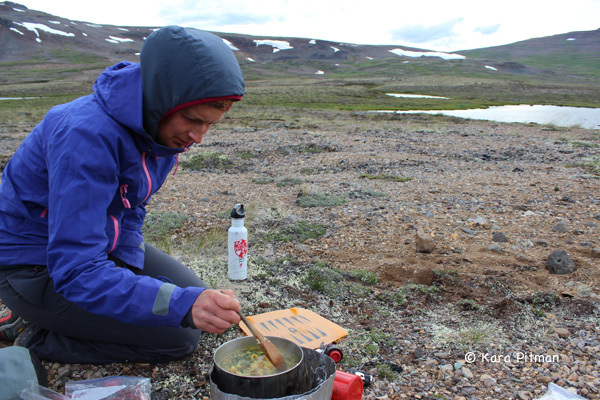 Usually we would start rehydrating upon arriving to our camping spot, set up camp, then start the much anticipated cooking process. At times the veggies were crunchy, but the flavour – bang on! Now, how better could a trip be planned – nine days divided by three people? Simple, each person prepares three dinners and three breakfasts and that person cooks their respective meals. Here is Jen cooking the Indian Lentil Rice Curry, I’d say this was a favourite! There is something to be said for ambiance. After a long day of working the body, the task at hand is finding the perfect home for the night, once settled and preparing dinner, we discuss the landscape being distracted only by the wishful wildlife sighting – all is calm. Senses are heightened, flavour is heightened. Determining portions can be a challenge. 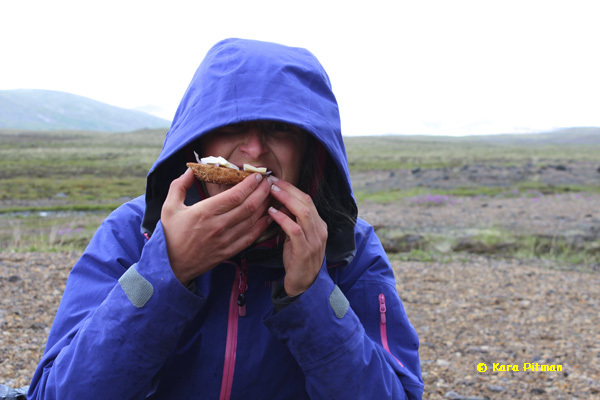 Nothing irks a hiker more than having to lug out excess food at the end of a long trip, or going hungry – not an option. We were shocked that our meal plan was dialed so tightly that at the end of our first portion we were able to have a small second to top up our hungry bellies. The Bagel with Brie, oh the Bagel with Brie – dare I say more!? Yes, it was topped with red onions and fried in the frying pan just enough to soften the Brie making it a warm way to start the day. We all agree that this is a great breakfast idea! Just be sure to get the canned Brie and eat it early in the trip to ensure it doesn’t’ spoil. 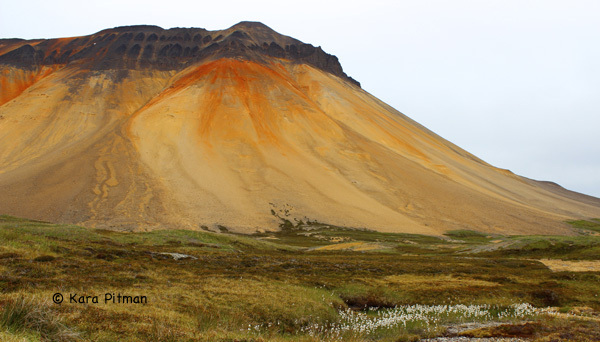 Anyone who has been to Mount Edziza and the Spectrum Range region knows that Yagi Ridge is the most challenging section of the route, it involves an approximately 620 m ascent on back-sliding loose rock. Basically, it’s sketchy! However, once at the top you are able to see Edziza Glacier and realize the expanse of the distance traveled and what’s yet to go. 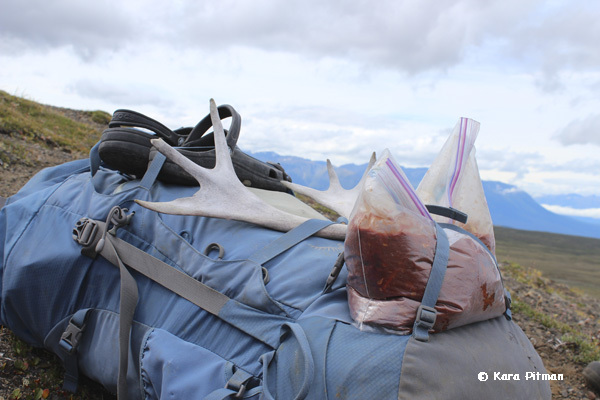 We were fortunate enough to set up camp among caribou, two bulls, two cows, and two calves – Big Caribou. Here we wanted a recharging meal and settled on Black Bean Burritos. They were spicy, filling, and so delicious! (A note from Deb: the link to this recipe is a previously posted rendition for three to four people). 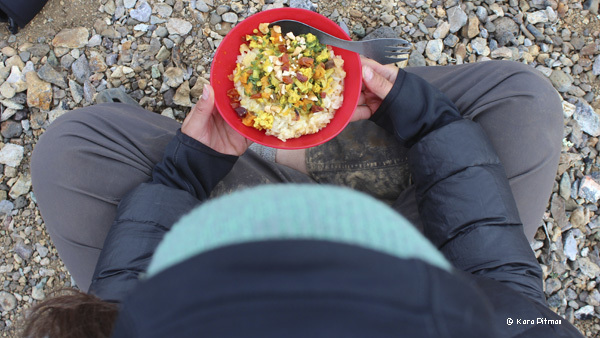 Yes, we still made room for the odd instant meal – Ichiban fueled us mid day when we were in need of a little pick-me-up to help us get over the next ridge. Laura fully embraces this day’s only moment of sun after a long a day of hiking in rain through the Mount Edziza portion of the trip. Deciding to set up camp in the Coffee Crater, hungry from the day, she opens her smartly packed dry bags of treats and nibbles on trail mix, beef jerky, and dehydrated farmers market fruit. The Tuna Wiggle. So good! Nothing else needs to be shared. Granted that you can eat all the diary needed in this recipe, be sure to pack this meal along. We still reminisce about the ole Tuna Wiggle. (Another note from Deb: the link to this recipe is a previously posted rendition for two people). Laura was in charge of the chili. We waited until our final day to try this recipe. 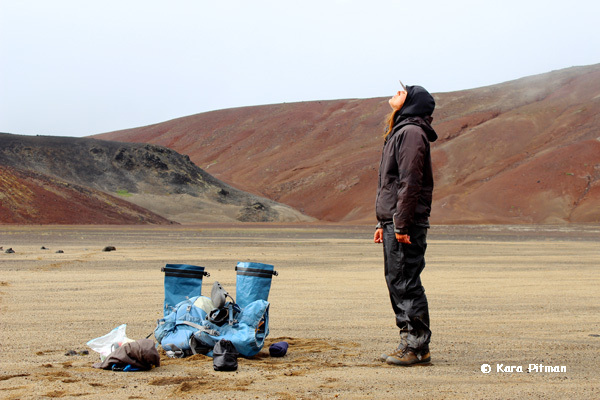 At a river crossing, Laura decided to start the rehydration process early, then it suddenly dawned on her that she would have nowhere to carry this potentially messy product. After holding it like a lunch kit for a kilometre or two, she crafted this set up. Genius! 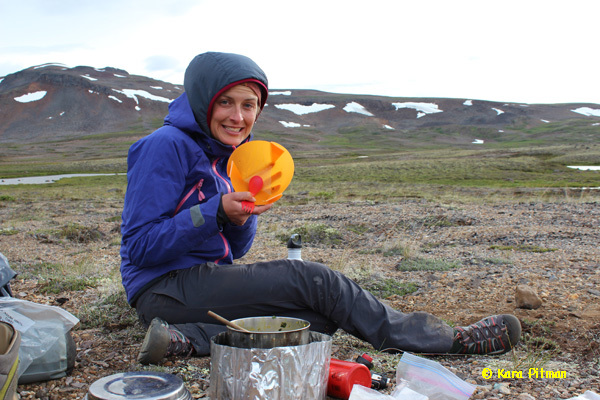 Laura and her chili in front of Edziza Glacier on our final night. We did have leftovers from this meal – but it was good! 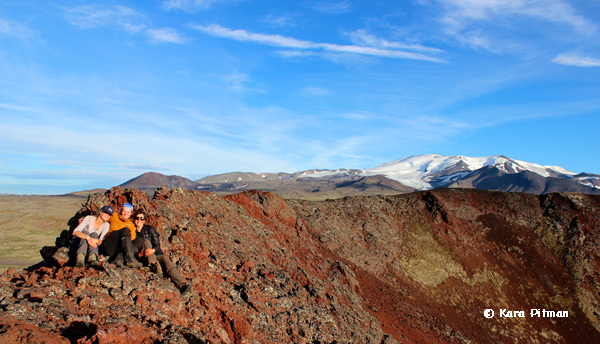 Sitting on top of Eve Cone with Edziza Glacier in the background. Our hearts fulfilled, bodies strong, and minds cleared. Thank you Debbie for your endless support in feeding us on this adventure. Every meal was incredible and we were fortunate to be fed by your backcountry culinary talent. 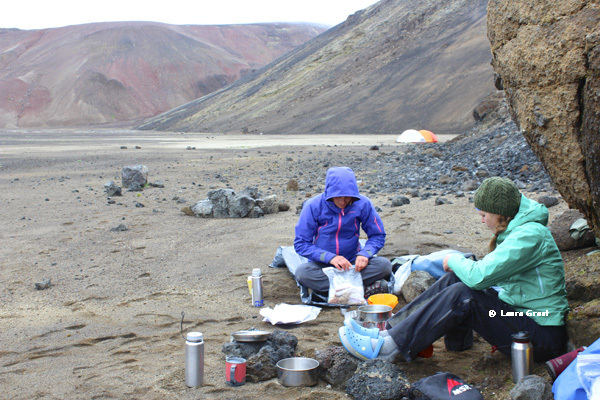 I have long dreamed of publishing a cookbook for camping and of trekking in the Mount Edziza and Spectrum Range area. So I greatly appreciate Kara’s, Laura’s, and Jen’s sense of adventure, enthusiasm, and tenacity for field testing some of my recipes. It was fun to see my dreams and friends come together in such a landscape: stupendous. Thank-you! Here’s the menu I gave them with links to recipes for those that I have already posted. Watch for recipes that are yet come. I’ll update this list with links to them here. Plus I’ll share our favourite breakfast, Grilled Bagels and Brie. As Lothar’s says, “Brie is the finest form of fat known to mankind.” With the feedback that I got from my friends, the wilderness women, I have some additional information that I will add to the recipes that I gave them, including ideas that should make the rehydration process faster and easier. When it comes to food, everyone has different interests and needs for food and cooking. So it makes sense to me to start providing ratings—related to cooking skill, relative weight, preparation time—with my recipes. That way you can decide whether or not a recipe belongs on your list for a particular trip. No matter what, it is possible to eat well out there.